Honestly, who would have thought it’d be rainy fogged-in weather on Labour Weekend? Apparently not us, because we had a fairly intensive tramp planned that would have gone from Rangiwahia over to Howletts, then back via Iron Gates. Unfortunately it rained and it snowed and it didn’t really work so well, but it was still worthwhile and from a personal perspective, I was still able to see places I hadn’t seen before. Location: Ruahine Forest Park, Rangiwahia to Heritage Road-end. People: Steve, Amanda, Paul and me. 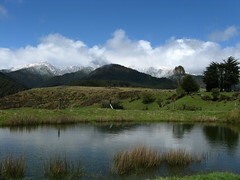 Huts visited: Rangiwahia Hut (1 night), Triangle Hut (0 nights), Iron Gates Hut (1 night), Heritage Hut (0 nights). Intended Route: Walk to Rangiwahia, then around Maungamahue and the back of Te Hekenga , over to Taumataomekura, Teraha and to Howletts Hut for Saturday night. Then via Daphne Ridge, Otumore and down to Iron Gates Hut (or possibly Triangle Hut) for Sunday night, before heading back up to Rangiwahia Hut and out again on Monday. Actual Route: Due to weather issues we went straight down to Triangle Hut and Iron Gates Hut on Saturday, before continuing to the Heritage road-end on Sunday and getting out a day early. After dinner from that Kebab shop at Bulls, we reached the Rangiwahia road-end at around 9.30’ish, I guess. At the very least, after the walk up the hill (which from past experience seems to take about 90 minutes), we were settling down at around 11pm on Friday night. The weather forecast was already dismal, without much suggestion that things would clear up until about Monday. Although we’d made plans to sleep in, Steve was still up and about at 6.30, and everyone followed. There was some teasing clarity in the horizon to the west, with Ruapehu clearly visible, but we were slightly more concerned about an incoming southerly. The rest of the range to the east of Rangiwahia was already clagged in — getting around the back of Te Hekenga and down to Howletts on the far side wasn’t an enticing thing, especially since it was likely to just be cold and clouded-in all day. Instead, we thought we might try starting the plan in reverse, in the hope that the rivers wouldn’t be up too much to interfere. So, after a casual breakfast, we packed up and left at 8am. It took about an hour to reach the ridge just north of Mangahuia, which seems consistent with the previous three times I’d been there. Looking over the edge, broken slabs of icy snow were still settled below us on the eastern side, making for an eerie walk through a fairly cold wind. 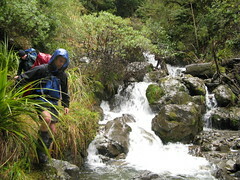 Within about 30 minutes we were walking down the spur towards Triangle Hut, budgeting on being there for lunch. 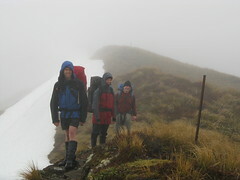 With the route down the spur quite slippery and covered in tussock, we were still on the tops until a little after 10am. From there we reached the relatively good track through the trees, arriving at Triangle before 11. Oroua River outside Triangle Hut. 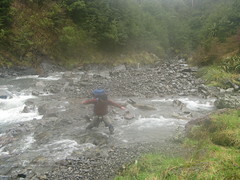 Despite the rain, the northern branch of the Oroua River outside Triangle Hut wasn’t flooded, although it was more full than it would often be. The first half of the walk to Iron Gates Hut (sometimes called Iron Gate Hut) is in this river, and the last few minutes requires getting over the main part of the Oroua River. Consequently, what we saw outside Triangle Hut did cause us to carefully consider whether we should be going any further. By the end of it, I think I was the last person being annoyingly indecisive, but we came to the consensus that the fact that it wasn’t flooded would mean that the main part of the Oroua River down-stream wouldn’t be flooded either. 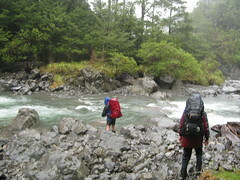 If we really got stuck somewhere, we at could at least fly-camp in the rain along the way until the river became safer. Besides, I’ve been at Triangle Hut when it’s raining a lot before, and if you really feel like going somewhere, the idea of potentially being trapped behind flooded rivers on all sides the next day really didn’t appeal. At around midday, we set off south along the river towards Iron Gates Hut (often referred to as Iron Gate Hut, although the signs in the area seem to call it Iron Gates). The river along here can be slightly gorgey, but in these conditions we always found reasonable crossing points that were rarely higher than knee-deep. There were a couple of minor areas where the current was uncomfortably strong, and it definitely helped to have someone nearby on firmer ground to use as support. At ten past one, we reached the end of the track leading over point 1037, to the other side where Iron Gates Hut is located. The first few minutes of this track follows a small stream up a gully, but it soon turns into a track of its own which is steep in some places, and without a lot of good hand-holds. It didn’t feel particularly un-safe, though, within reason at least. end of the track to Iron Gates. On the southern end, this track crosses one side-creek before sidling along a hillside above some nice waterfalls (down which I was glad we didn’t need to climb), before landing at the main part of the Oroau River. As we expected, this river also wasn’t flooded, but seeing it was enough to prompt me to put my camera away for a while. In hindsight I’m really glad that I did. The current was quite strong, but after some surveying and brief experimentation up and down the river, we eventually found a place we could cross reasonably comfortably. This was relief for me, because I’d had in the back of my mind that we might become stuck somewhere between the two huts and have to camp out… which is why both Amanda and I were both slightly surprised when Steve, who’d been here recently, hopped straight back in the river a little further down and led us back to the side we’d started from. Iron Gates Hut was still a few minutes along the river, and it seemed that there wasn’t a clear route to it without a couple of extra crossings. part of the river near Iron Gates. We were able to continue along the river-side for a few more minutes, but finally reached a point where some fast-moving rapids combined with an apparently gorgey rock-face on our side. It looked do-able to get around, but we just might get a bit more wet than we were already. In the distance on the far side of the river, we could see smoke wafting from the trees, indicating that there was someone home. Steve was the first to lower himself down into the pool, which had a convenient ledge below it, and work his way around the edge of the rock-face. I followed, and soon found I couldn’t see Steve ahead of me. Leaning backwards turned out to be a bad idea because I started floating on my pack and drifting away from the rock-face. It worked out fine, though, because Steve was grounded just around the corner and held out a hand to pull me in. Amanda and Paul followed, and the four of us now found ourselves standing in a small in-set into the rock on the far side of the river. Getting over to the far side from here was a challenge, but we managed it with the help of Steve (again) who anchored himself somewhere in the middle so as to help pull everyone past him and out the other side. That was an experience. As we approached Iron Gates Hut at about 3pm, maybe in some kind of jovial mood, we met the three current occupants as we searched for dry clothing. The two Oringi Raincoats hanging outside suggested some kind of strong outdoor affiliation before we’d even met them (that’s my current theory, anyway), and it turned out they’d come down from Auckland for the long weekend as an expedition on behalf of the Toi Toi Trekkers Tramping Club. Earlier on Saturday the three of them had walked in from Heritage Lodge. 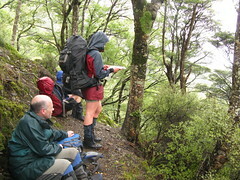 I think their original plan had been to walk up further to Triangle, then up to Rangiwahia and out that way, but by the time we’d arrived it sounded as if they were now intending to return the way they came — probably due to weather. They had a nice fire going and were busy drying some of their things… presumably things that hadn’t been well stashed underneath their impressive raincoats. Steve, who had been starting to feel sick-ish, hopped up to one of the top bunks for a snooze. Amanda, Paul and I settled into the accommodation for the rest of the afternoon, with myself catching up on some reading before Amanda became the central figure in preparing a nice pasta and vegetable dinner. It rained in patches overnight, sometimes intensively, although the river had actually gone down when I went out to check it on Sunday morning. Specifically, it’d gone down by about 3 centimetres in the wide, wave-prone section that I’d been using to wash the dishes the night before. Looking up to the tops, however, they still didn’t look at all inviting. They’d received more snow overnight, which boded for a potentially long and quite hard next couple of days. According to the plan, we’d still need to be getting up to Howletts, which would probably take at least 6-7 hours in the conditions and wouldn’t be very scenic. That would be followed by a long day of walking on Monday, probably at least 10 hours, and then a long, late and tiring drive back to Wellington on Monday night. Steve’s condition, which seemed to have become more doubtful overnight, was also a convenient excuse for us to not bother trying. There were a couple of other options we thought about. One was to go back the way we’d come, past Triangle and then either head straight back to Rangiwahia for Sunday night, or down to Pourangaki or Kelly Knight (perhaps more interesting). Neither seemed that inviting, and with the Oroua River still flowing quite strongly it would have been more difficult to walk up against the current. We’d definitely need to be looking for different crossing points from what we’d used the day before. The LINZ map also indicates another track heading up a spur towards Rangiwahia from about the half way point between Iron Gates and Heritage, but Steve’s attempt to come down this on another occasion several months before had suggested that it actually wasn’t much of a track at all, and may actually have been densely overgrown. So in the end, we reached another consensus decision to simply walk to Heritage Lodge (near a road-end), and to figure out some way to get back to the van once we arrived. We left Iron Gates Hut at 8.45am, saying goodbye to the Toi Toi Trekkers who’d been waiting in bed while we packed up. It was a nice bush-walk through the rain, with a few undulations and a couple of crossings of side-creeks, but ultimately easily do-able. During one of our brief stops at 11.15am, we could see Heritage Lodge in the distance. 20 minutes later, having followed the sidling track around the hillside, we were there, and immediately greeted by two very friendly chaps from the Manawatu Branch of the New Zealand Deerstalkers’ Association. It was still raining, and although the sun almost emerged from time to time, it continued to tease us. Heritage Hut (sometimes called Heritage Lodge) is an NZDA-built facility. An old lodge on the site burned down in 2005, apparently after some visitors let the fireplace get too hot and then packed up and left. [Edit 9-July-2010: There’s another side to this story described in the comments section below.] It’s since been re-built by predominantly NZDA volunteers, with the help of many sponsors. The new facility is a fantastic lodge. The NZDA guys had a warm fire going and offered us hot water for a cuppa as we walked up, which was a great way to say hello. They were also keen to show off the features of the lodge, which we continued to take in as we settled down for an early lunch. 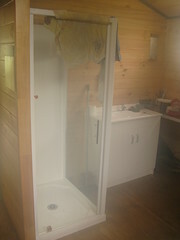 For the record, anyone who thinks that kiwi hunters always like it rough needs to take a look in the private NZDA section of the lodge (NZDA permission would be required), which comes complete with a mini-kitchenette and a shiny shower cubicle. So much for the whole lowering-your-standards philosophy of the outdoors. The other people we met at Heritage were a couple from the Forest and Bird society, who’d walked up the track from the road to survey the area for a potential club trip they were planning in the near future. They were very friendly and helpful, and ultimately we were able to arrange for Amanda to walk back to their car with them, and then for them to drop her off at the Rangiwahia road-end to collect our van. The three of them left at about 12.15, with a loose arrangement that Paul, Steve and I would follow about an hour later. With nothing much else to do, Steve found a bunk to lie on for another daytime nap, while Paul and I chatted with the NZDA people and browsed the hut literature. Steve at the Heritage road-end. The remaining walk back to the Heritage road-end almost feels as if it’s a vehicle track in some places, and having left at 1.30pm and moving at a very relaxed pace, we were at the fence bordering Ruahine Forest Park about 20 minutes later. The timing was good and Amanda drove up at about 2.15pm, just as we’d begun to walk down the road. As Steve pointed out, leaving on Sunday instead of Monday (Labour Day) had the added advantage of us not having to pay a surcharge at the cafe in Kimbolton, where we stopped for a decent second lunch. With breaks in the weather emerging, we could now clearly see the freshly snow-capped mountain range over which we might have been walking if the weather had played more nicely earlier in the day, but I guess on this occasion it wasn’t to be. We really needed two days of good weather to have carried out the original plan and for it to be worthwhile. Attempting it in reverse also complicated things further by putting the longest day of walking on the same day we wanted to drive home, and the uncertainty of exactly how this would pan out was a significant factor in us deciding to get out early. I still got to visit several places I haven’t been, however, and we’ll probably get another chance to try it again in the future. What the storms left behind. 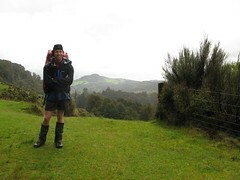 This entry was posted in tramping and tagged bagged:heritage hut, bagged:iron gates hut, bagged:rangiwahia hut, bagged:triangle hut, change of plans, rain, rivers, ruahines, snow, tramping, wellington tramping and mountaineering club. Bookmark the permalink. Hi there… I was searching for information on the old Heritage Lodge and found this site. Just to let you know the other side of the story, since I am the one who burnt it down. We (myself and 5 young women I was taking into the bush) had come in the late afternoon on a very rainy day and started a fire in the fireplace to dry our clothes and thaw out around. We noticed at about 10pm that embers were falling from the chimney, so put the fire out and tried to put the chimney fire out as well. The fireplace was very large, so we couldn’t cover it to lessen the oxygen to the fire, but there were two very old-style hand-pump fire extinguishers that we used to squirt the inside and outside chimney with, as well as passing buckets up and down the line to throw water at it. The chimney on the outside was so old that we could see fire burning through the many chinks, but we just couldn’t put it out. All this time, we were not too concerned, since it was pouring with rain outside and we doubted the fire could last long in the wet. I had asked my companions to pack their things up in case we had to evacuate, and after about 15 minutes of our continuous trying to put the chimney embers out, the smoke increased to a point that we had to evacuate. Some army personnel were camping as part of a training exercise at the car park, so I sent two of the party on ahead to get help from them, while the rest of us walked carefully out. It was pitch black and pouring with rain – not so easy to see by torch light. Anyway, some army guys met us on the way out but soon rejoined us at the carpark, saying there was nothing they could do. A few minutes later we saw a flash of orange light and realised that the hut had gone up in flames. Such a shock! I called 111, not thinking they could do anything, but still good to let them know. Not long afterwards, two fire-engines came screaming to the carpark and all these volunteer firefighters bundled out in full gear, asking, ‘where’s the fire?’ We pointed to the glow in the hills and said ‘half an hour that way!’ They then took out their cigarettes and joined us in watching it burn. None of us were able to do anything. About 1:30 that morning, a DOC representative came to the carpark, where we’d set up tents to sleep in instead, and interviewed me about what had happened. He said the hut was a disaster waiting to happen because it was so poorly maintained, and that he was grateful that we handled it in the way we did. So, anyway, that’s what really happened. Just so you get the other side of the story. It was some adventure for sure, one that I hope I NEVER repeat. Still love the bush though!! Just a note to Shirley. I passed thru the old Heritage lodge many times on the way in or out of the valley, and the old hut was indeed an accident waiting to happen. One day in the 90’s when my now 17 year old son was 5-6 we arrived there and decided to walk down to the river to camp as the place was a mess and the fire place just did not look safe. I recall another day in 1999 arriving there from Iron Gates in torrential rain and stopping for a rest, some dry gear, and just to wait out the rain for a bit. I thought of building a fire but one look at the condition of that thing even then put me right off that idea as it was worse than a few years prior. It is good reading your account that you guys were still up and awake as had you been asleep it doesn’t bear thinking about. And having spent a night in the “new” hut it has a much better back country feel to it, the wood stove is exceptional, the private hunters quarters ideal, and as long as people pay their way, it is a story that has a good ending. Happy tramping. Thanks Robb and Shirley. It’s good to have some first-hand accounts of these things. I never had a chance to visit the old Heritage Lodge, but the new one’s very nicely done. The note in my post “apparently after some visitors let the fireplace get too hot and then packed up and left” is interpreted information from conversing with the NZDA people we met at the lodge on this occasion. They were quite closely involved with looking after and maintaining the hut, and eventually rebuilding it. To them it was far more than a template DoC-provided facility (which it never was anyway) and they would have been affected quite personally by the fire, and likely had a different view. They were really chuffed with their new lodge, though, and were very keen to show the whole thing off to us when we randomly walked up. All this said, it’s true as Robb pointed out that it would have been a devastating tragedy if you guys had still been inside it. As it happened it was lost property. I guess the important thing is that sometimes these things happen and property can be replaced. All’s well that ends well. I’m glad they have a nice new hut and I’m very glad that we’re still alive! I really do hope that this new hut continues to stay better maintained than the last… great to hear it has a good wood stove. Hope to visit it some time soon. I dont’ know what drove the NZDA to make your quoted statement “apparently after some visitors let the fireplace get too hot and then packed up and left”, but it really makes me angry. Were they involved in the maintenance of the chimney? A chimney fire is not caused by the user of the fireplace or logburner; it is caused by bad or absent chimney maintenance and cleaning, resulting in buildup of combustible materials inside the chimney, which eventually WILL start to burn; the chimney effect will then drive that fire to very high intensity very quickly, burning down the hut. A properly maintained chimney will NOT develop a chimney fire no matter how hot the fire is in the fireplace or logburner – simply because the chimney itself is not combustible! This incident was a very close call for DOC, and I think and hope they know that. If lives would have been lost, there would have been such a full blown investigation that they would not have had a chance to convince anyone that it was user error. Hi Matt. Thanks for the insight about the chimney maintenance stuff. I find it hard to imagine that DoC wouldn’t have some kind of chimney checks and maintenance on their regular hut inspection list, given the risks involved. I have no idea what the state was at Heritage Lodge or whose responsibility it was. I wasn’t even deeply involved in tramping when it burned down, let alone familiar with the lodge. Maybe someone else reading this can comment, though. I should also clarify that the statement was not any official line from the NZDA whatsoever, and it’s not an exact quote. It’s my interpretation of what I thought I heard from one of the members we met from the NZDA’s Manawatu branch. Any direct statement from the NZDA about what happened from their perspective would trump what I’ve written here. I think it was an off-hand comment that would probably have been more clear and specific if it were stated in a less conversational context. I just included the note in my original trip report as an aside. Having stayed at the new Heritage and talking to the hut warden then in residence, my understanding is that the hut is owned by the NZDA, and that they allow DOC to use and charge fees for the use of the hut. I would imagine this has to do with the fact it is basically a private hut on conservation land and this a quid pro quo arrangement. The warden was staying in the attached private locked quarters which is used by the NZDA and has access to the public area with bench bunks and the wood fire. So in terms of applying legal responsibility I am not a lawyer so not sure what sort agreement they have, or had in place. Suffice to write as I did previously that the old lodge was a hole, and the new place is a vast improvement. Interestingly the hut warden, whom I have stayed in contact with, was there at the behest of the NZDA and not DOC. He was also attending the long stoat and rat trap lines laid in the valley past Iron Gate, and looking after the hut. He left the job not long after as he said the worst part of the job was trying to get hut tickets out of people staying in the public quarters and putting up with everything from excuses to extreme aggravation. Ties in well with your recent post on hut fees and something that did not pop into mind until reading Matt’s comment. i thought fire risk was a major reason for removing older huts. I would prefer to have old huts left intact rather than removed. and live with the risk of fire. Older huts should just have a doc sign saying that the building is unsafe and use at own risk. Its sad when old but still strong and weather proof huts with nice open fires are removed. @Robb — Hi Robb. The arrangement rings a bell although I’m unsure where I heard it. I think one of the conditions for the NZDA to have built (or maybe retained) their hut on conservation land might have been to set aside part of it for members of the public to use. It’s sad to hear the story about your friend having to argue with people about hut fees, even given it wasn’t even related to DoC (I think), but it sounds like a common story. (The Fish & Hunt forum conversation is still going, and there are some interesting comments in there from people who hate DoC.) I think DoC needs to change some things elsewhere rather than just hoping wardens will solve problems, especially volunteer wardens. In an honesty system people should be paying because they want to and can understand why they should, not because they’re afraid not to (which will never work anyway). I can vouch for Shirley’s story – I was one of the army guys at the road end, and was also a member of the Manawatu NZDA at the time (not that this is official NZDA correspondence – I am no longer a member as I live overseas). I walked into the lodge as soon as two of the people in her party arrived at the road end, and could see the glow of the burning hut when I left. By the time I got there it was entirely engulfed and I couldn’t get close to it because of the heat. It is sad that they were accused of leaving the hut without fighting the fire. If that had really happened they would have come out as a complete group, not as a pair followed later by the remainder of their group. There were a couple of club members who jumped to the conclusion that the trampers had let the fire get too hot, but if that was really a risk then they should have replaced the fire as a danger to all who used it (including themselves and their own families). I certainly don’t recall this being discussed prior to the fire and don’t think it represents the view of most club members. DOC used to inspect the hut at least annually for safety and compliance. That said, I don’t recall the fire being mentioned. The new hut is an excellent facility. It is a tribute to the generosity of the Nash family, the can do attitude from DOC, and the efforts of the NZDA Manawatu branch members who put their time and effort into replacing the facility with something better. I think I recall one of Mrs Nash’s daughters at the opening talking about how the hut was a great introduction to the outdoors because it was close enough to the road end for easy access, but far enough into the bush for you to feel like you had escaped from civilisation. I hope it stays that way for years to come. The most important thing is that the group got out safe and well. I agree with Matt – this would have been far worse if the group was already asleep when it happened. It is a lesson for all clubs on the difference between compliance and maintenance. Hi TC. Thanks for the further comment. The old hut is before my time (I’m a juvenile when it comes to getting outdoors), and it’s very interesting getting all this info together. As for that statement, I’d not be surprised if it was just someone shooting his mouth off a bit.